Charging your iPhone outside of your home means lugging around not only a charger but that bulky iOS power cord. You see more white cords plugged into things than inside the Matrix. As an alternative to the big chargers you can plop your devices onto an induction charger (which are actually really cool, but not terribly mobile). One new invention will hopefully eliminate these problems. 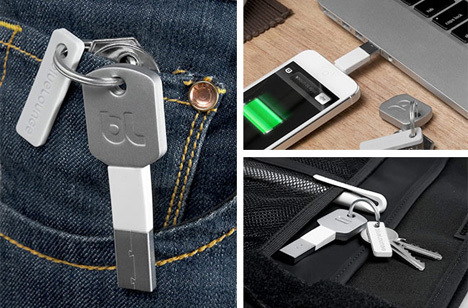 The Kii charger from Bluelounge is small enough to fit on your keychain and even looks like a key. 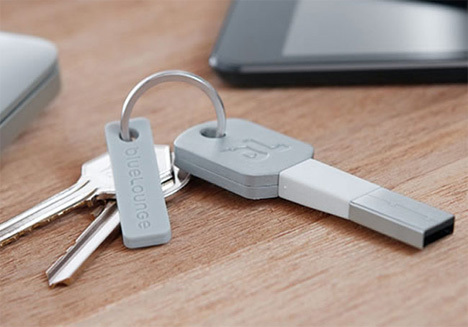 One end of the key will fit in your iOS device, the other end in a USB port. The Kii is available in 30-pin and Lightning configurations, ensuring that even those of us without the most current generation of iDevices will still be able to use it. When everyone starts carrying a Kii, it won’t be an outlet they’re looking around for – it’ll be a USB port.